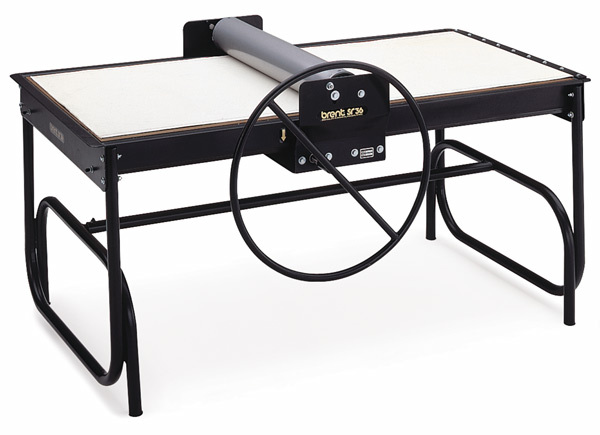 The Brent SR-36 Slab Roller, designed for efficiency and ease of use, is a rugged workhorse that will stand up to anything your students roll its way. Built to last, the SR-36 is a large floor model that can produce slabs up to 36"W × 52"L. It features heavy-duty steel pipe construction, a circular handle that moves the roller through a double cable system, and cast iron mounted ball bearings for complete rigidity. Convenient canvas-covered boards make the picking up of rolled slabs easy. The maximum slab thickness that can be produced is 7/8" thick. Three shims are included, one 1/4" plain shim, one 1/4" with canvas shim, and one 1/8" plain shim. When assembled, the Brent SR-36 Slab Roller measures 49"W × 76"L × 40"H. It has a shipping weight of 706 lb. Receive up to $275 in Amaco lead free glazes when you purchase any piece of qualifying equipment. Click here to download the mail-in rebate form and offer details (PDF).